Use the water hose to put out all fires. Use the two robbers as a team in order to steal from the rich and give to the poor in Night Robbers. A fun game where you take the advice of the game instructions for that level. Throw minis at other monsters to win the level. Memorize where the pumpkins are and find matching pairs. Use the three sheep to solve puzzles in the depths of space and return home. Ricochet bullets off walls and other objects to kill all the people in Silent Killer 2. Put together combinations of three or more of the same building. Kind of like DDR with the keyboard. Use your mouse to move the shape to collect the stars and reach the exit. 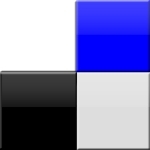 A fun puzzle game where you must slide blocks of the same color together.